Cloud backup company, Backblaze, has just released their updated Hard Drive Reliability Report. They have over 34,800 hard drives, and store over 100 petabytes (1,000 gigabytes) of data. As a result, they need to keep track of reliability for their internal purposes. They also make this information available to their customers and partners to help determine which hard drives are reliable, and which ones should be replaced. For backup companies like Backblaze, a hard drive failure isn’t an issue. They have redundant systems that backup and restore any lost data. For consumers, however, it is a different matter entirely. As I have written before, It is important to back up your data. For both groups, however, it is still important to know which drives are reliable, because, replacing a hard drive costs money. Even our services can run as much as $200 for a hard drive replacement, OS reinstall, and Data recovery. Failed Hard drives cost time and money. To that end, Backblaze tracks what drives do well, and which ones fail regularly, so they can determine which to purchase. The good news is that the chart they put out last week looks a lot like the one from January, and that most of the drives are continuing to perform well. It’s nice when things are stable. 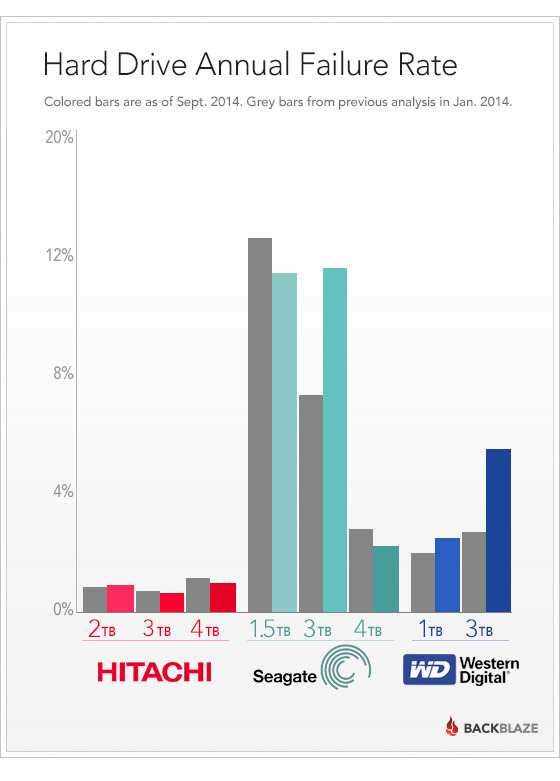 You can see that all the Hitachi drives, the Seagate 1.5 TB and 4.0 TB, and Western Digital 1.0 TB drives are all continuing to perform as well as they were before. But the Seagate and Western Digital 3.0 TB drives failure rates are up quite a bit. It may be that those drives are less well-suited to the data center environment. Or it could be that getting them by drive farming and removing them from external USB enclosures caused problems. they’ll continue to monitor and report on how these drives perform in the future.